A couple of weekends back, I happened on a trio of punctuation symbol wall art, on sale at TJ Maxx, that I could not pass up. A ampersand, a # sign, and an @ sign – nifty… and only $7 each! The pieces were kinda beat up; hence the deep discount. I had various ideas for refinishing them, but the best one came to me while I was doing my stairs at work. Candy wrappers! I decided to decoupage the symbols with M&M wrappers. The packaging is wonderfully vibrant, perfect for a funky art display. I figured I’d need 15 packages of the three different flavors I’d chosen. But… what to do with all that candy? I certainly couldn’t eat it! Most of the chocolate became gifts for the lovely ladies who work behind the bar where my BF and I met. A couple of years ago, I bought a set of four clear glass tumblers that came with removable vinyl stick-on words. I’d been considering getting rid of them because I never used them, and this became the perfect opportunity. 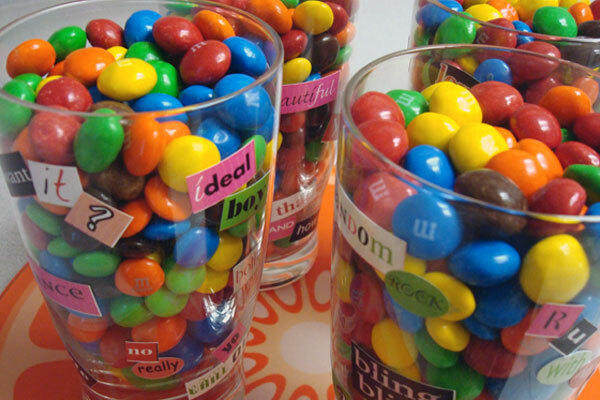 I layered the three flavors of M&Ms in the tumblers and decorated them with the stick-on words. The bright colors coordinated well. Pretty! I think they made a festive gift. I brought them down to the bar when we popped in earlier this week. The remaining candies that wouldn’t fit into the tumblers went into a Decadent M&M Cake I invented, using stuff I had on hand. Preheat oven to 350 degrees and mist 13×9 baking pan with nonstick spray. Empty cake mix into bowl, pour in diet soda and stir to combine. Stir in Dark Chocolate M&Ms. Bake according to package instructions. Allow to cool. 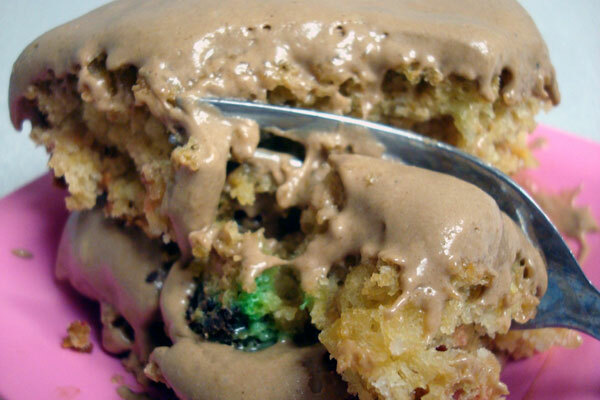 While cake is baking, microwave Peanut Butter M&Ms in 30-second intervals, stirring each time, until melted. Stir Cool Whip and marshmallow creme into chocolate until well blended and chill. When both cake and frosting are fully, cooled, spread frosting on cake. Entry filed under: food review, friends, recipes. Tags: candy desserts, candy gifts, food gifts.